so said ellie: In another life, I was probably not an elite sportsperson. In another life, I was probably not an elite sportsperson. To be fair, we were trying to make it up a hill at the time. I have my immunology final on Thursday and a huge pile of revision to do for it. Never in my life have I had a exam that was worth 100%. I'm also not used to having almost two weeks with no class to prepare for it, so the motivation to study aforementioned huge pile of revision is somewhat lacking. Hopefully my stress response will kick in by early Monday and I'll start freaking out enough to actually get somewhere. Also on Thursday is my first outside Sweden adventure since I got here: we're catching to night bus to Oslo. Hooray! Oslo! And to make things even better, it's only 7 and a half hours, which, compared to last weekend's little soiree up north, seems like a walk in the park. I think I might spend the afternoon in Stockholm, but there's not really much there that's different to Uppsala (I'm thinking clothes shopping, scope for which is sadly-and unexpectedly- limited in Sweden) so I haven't decided yet. I'm definitely going to bully Robert into an IKEA trip; he's moving into a new one bedroom place on Monday and going to IKEA should give me some much needed retail therapy and bring me one step closer to my dream of setting foot in an IKEA in every Scandinavian country. Actually, the guys we were sitting with on the train back from Kiruna didn't really get my IKEA obsession...it's just that..it's IKEA: what's not to love? Ooh, and I'm so excited that in Swedish IKEA they sell bathrobes and inflatable neck pillows: I really copped a beating on the train for that pillow, but it was so soft and fuzzy and blue, I couldn't say no! Pro: It won't take me 45 minutes to get to class in the morning anymore, or alternatively, it'll save me the 20 kroner bus ticket..which is kinda related to the Con: I'm a fatty boombahlada and haven't ridden a bike for at least 6 or 7 years, so if there are any hills involved, the time saving on 45 minutes could be questionable. Lauren and I rode out to Maxi ICA last week which was an interesting reintroduction to bike riding. At first it was trés scary and wobbly, but once I got into the swing it was ok. It's just that there's a very slight incline the whole way there, and even though it looks flat, I had to stop for a breather half way. Things can only get better.. surely? 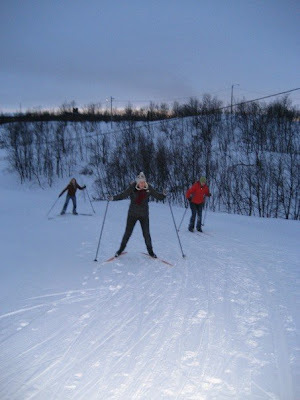 Which really brings us back to the cross country skiing that this whole post was originally about. As far as endurance goes, it really wasn't too bad (but now that I think about it, maybe the reason I wasn't puffing like a chimney and sweating was because I wasn't really moving that fast..), and apart from the moments I stared death in the face it was a lot of fun. Perhaps I will really get into bike riding and get all sporty and go on long bike rides to lakes and have picnics and stuff. Oh, and before I forget, here are the cupcakes we made last week for the birthdays of Trevaaah and Rob. Art in motion. as if you are a fatty bombahlahdah! i love that term... i just had to comment..